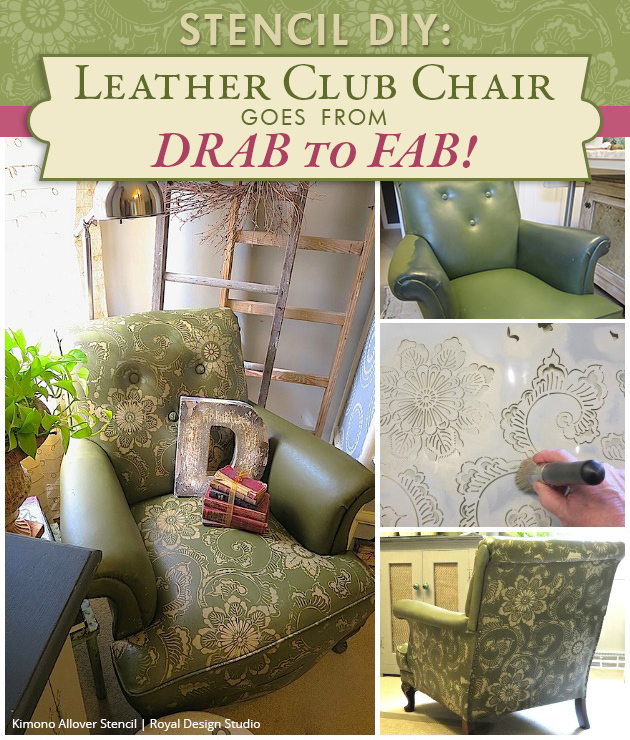 Home / How-To + DIY / How to: Chalk Paint® Decorative Paint / Stencil DIY: Leather Club Chair Goes Drab to Fab! 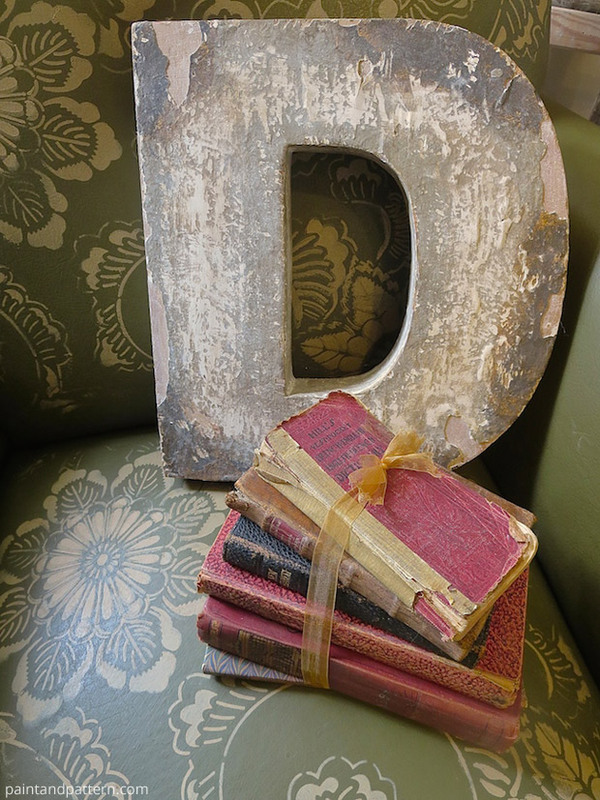 Have you become obsessed with Royal Design Studio stencils and Chalk Paint® by Annie Sloan? It’s no secret that I am passionate about the possibilities of using both together. 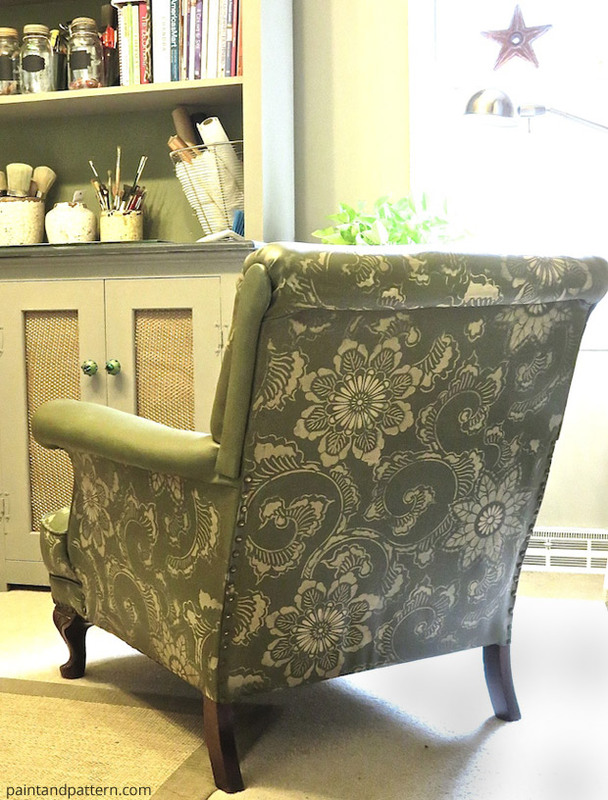 You may have seen my stenciled and painted sofa earlier this year on Paint + Pattern. 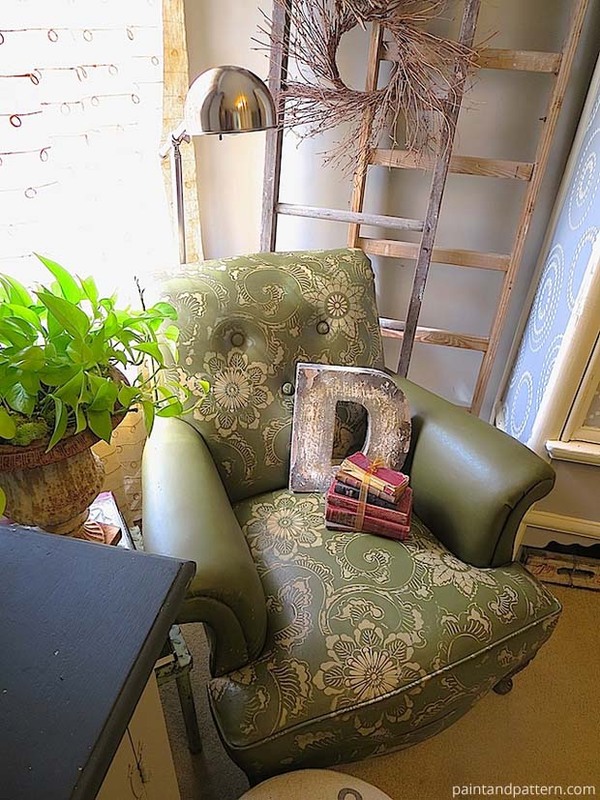 I so loved it, that I wanted to do a “pleather” club chair that I picked up for $75 at a consignment shop. It is my home studio “curl-up-with-a-magazine” spot. If you have a piece to try this on, let’s paint! If not, fall is the perfect time to grab friends and a pumpkin latté to hit the Saturday morning yard sales. 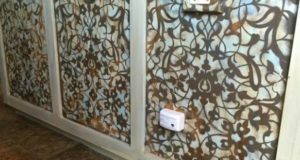 One caveat: this is the perfect project if you are an experienced – or – adventurous stenciler. If you crave absolute perfection, a project with flat surfaces may be more fun for you. 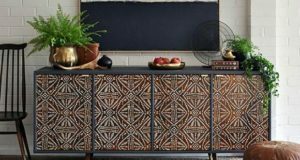 If you love trying something new, where the design pattern may have to fit imperfectly around corners and in nooks and crannies, great! Give your piece a good cleaning. If it’s fabric, just wipe with a cloth if necessary. Since mine was leather-like, I wiped it down with soap and water and dried it off. I decided not to paint the wooden feet, so I taped them off. 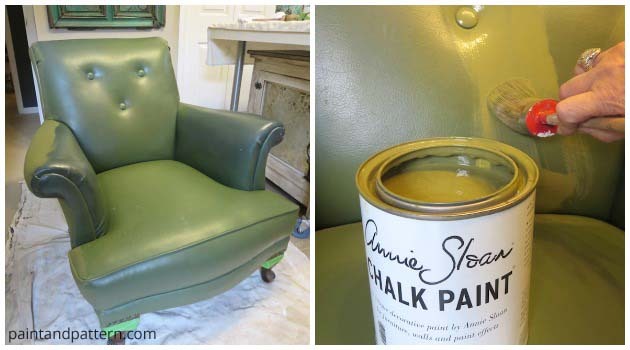 Using Olive Chalk Paint®, paint two coats and let dry. 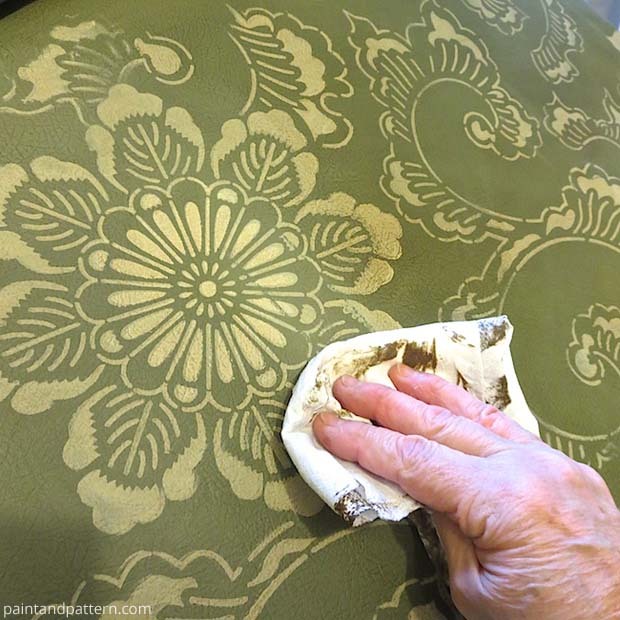 Pro-tip: If your piece is fabric, mist it lightly with water, using a sprayer. Pour some paint in a different container, add about 10% water for the first coat so that the paint will penetrate the surface of the fabric. Use full-strength paint for the second coat. Design your piece. Do you want it to be simple or ornate? 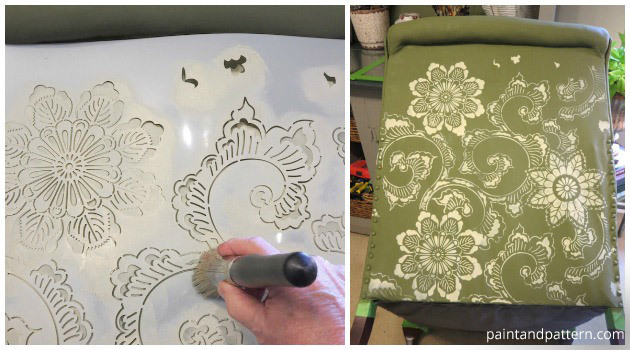 Do you want to do an all-over pattern or just elements of the stencil ? 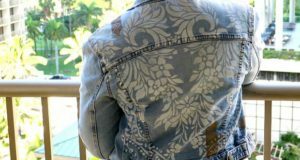 Begin stenciling using Country Grey on the back. Why? Since it often will not be seen, it’s a great place to practice. Of course, you can always repaint anything if you change your mind. 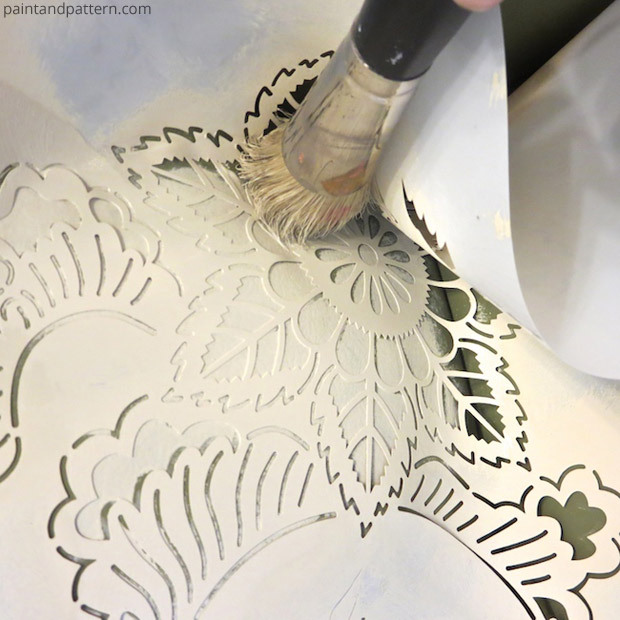 Find a spot on the stencil that looks good as the center pattern, tape the stencil and begin stenciling the design. Pro-tip: Sometimes the tape doesn’t stick well, so have your paint, paper towels for off-loading and brush nearby in case you have to hold the stencil in place. 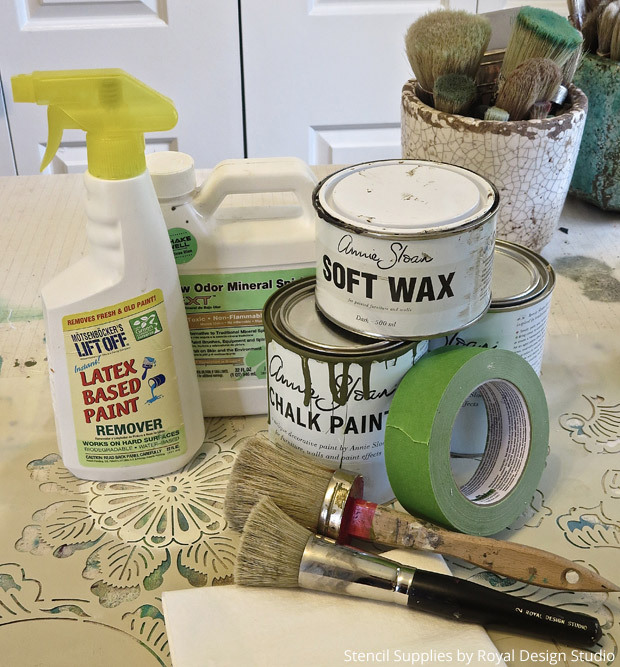 In a clean container, mix one part Dark Soft Wax to one part mineral spirits to make a glaze to soften and age the look. Using an old chip brush, brush on the mix in sections then immediately wipe off any excess wax. Wax the feet as well! When complete, wait 30 minutes or so, then wipe and buff again with a clean cloth, until all areas are wax-free and have a soft finish. 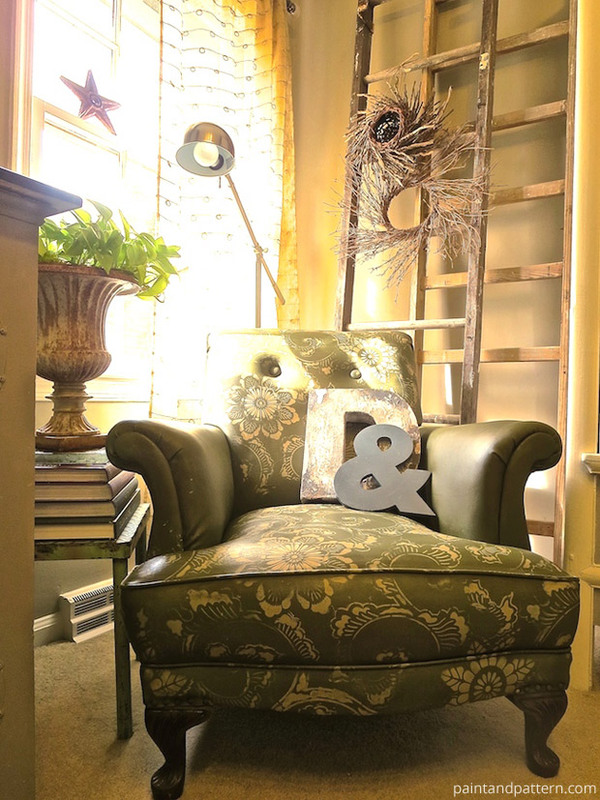 I am so excited to have this chair completed and I hope you have fun working on yours. If you read this post and feel more comfortable starting out with something more simple check out this post on beautiful and quick plate chargers. Debbie this is beautiful! It looks like a completely different chair. I like how you left the arms plain for some contrast. This is making me want to dig through fabric boxes and find some pleather I know is buried in them! You did a beautiful job. It’s gorgeous! Thank you Debbie! It is now Lacey the kitty assistant’s favorite spot while I work in the studio. Can I do this on a leather ottoman? can I do this on leather shoes? can I do this on a leather purse? Sure Mia, lots of folks do. Remember that wax is an interior product.